Overwash events occur often along the Cape Hatteras National Seashore. Understanding the effect of overwash processes on beach topography is an important aspect of shoreline evolution and barrier island landward migration research. 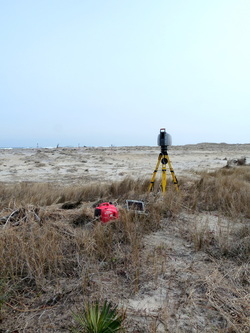 In February 2010, I traveled to Pea Island, North Carolina to assist with the survey of a section of beach which had been overwashed in a recent storm. The February survey provided a second survey to a previous November, 2007 survey of the area. Terrestrial Laser Scanning is not often used in coastal geomorphic research, so a more traditional coastal survey was made by RTK-GPS (Real Time Kinematic) to compare the efficiency and accuracy of the two survey methods. A Leica Scanstation 2, dell ruggedized laptop and Honda 1000 watt generator were used to survey the overwash fan. The control network consisted of a diamond pattern of four Leica high definition targets. Scans were made from seven separate locations. 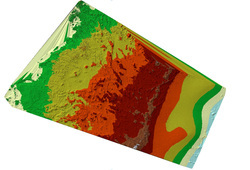 From the surveys, two 5cm digital terrain models (DTM) were created, visualizations of the overwash fan were produced and analysis of the change between surveys within the context of coastal geomorphic research were made. The findings were conveyed through a fifteen minute presentation and research paper.